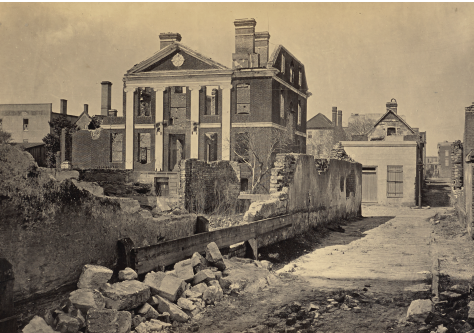 Ruins of the Pinckney Mansion, Charleston, South Carolina, 1865, George N. Barnard. One of the South’s most important historic sites, The Pinckney Mansion, is about to be the subject of a nationally relevant archeological dig. The Pinckney Mansion, among the first grand homes in Charleston, was an early inhabitant on Charleston’s colonial waterfront. “[The Pinckney Mansion] is arguably the most important site in colonial Charleston,” according to architectural historian and preservationist, Ralph Harvard. The site could contain remnants and artifacts from the grand mansion, as well as valuable evidence from slave quarters. Charles Pinckney built a sprawling mansion in Charleston, South Carolina around 1746 at 235 East Bay St. The Pinckney Mansion burned down in 1861, and the site has since been home to a coffee shop, a pub and in the future, Hotel Eliza. Findings from this historic dig will be incorporated into the lobby of the new hotel, as a nod to the site’s past. Hotel Eliza’s name was chosen to honor the home’s historic owner and American business pioneer, Eliza Lucas Pinckney. Eliza Lucas Pinckney singlehandedly changed agriculture in colonial South Carolina and developed indigo as one of its most important cash crops. In 1753, President George Washington served as a pallbearer at Pinckney’s funeral. And in the 20th century, Pinckney was the first woman to be inducted into South Carolina’s Business Hall of Fame for her contributions to South Carolina’s agriculture. The Pinckney descendants have been some of South Carolina’s finest statesmen and politicians. “Part of the allure of this site was the significance of it in our city and our nation’s history. We, along with many historians, have always wanted to unearth any of the hidden pieces of the story it has to tell and to include those in our hotel to give it a true and tangible tie to its beginnings,” said Dean Pearce, of Pearce Development, the owner of the property on 235 East Bay St. In spite of no architectural ordinance, Pearce Development initiated this pivotal dig out of commitment and respect for the city’s rich history. “The Pinckney Mansion was one of Charleston’s grandest homes in the 1700’s and we are looking forward to what the findings could unearth about early Charleston history,” said Pearce. Eric Poplin, Senior Archaeologist & Vice President of Brockington and Associates, will lead this project and break ground on the historic dig this fall. Poplin has worked on many similar projects in the area throughout his long tenure in the Lowcountry. Recent projects have involved data recovery excavations at the 1710s-1920s Combahee Ferry site in Beaufort/ Colleton Counties (South Carolina), the 1790s-1850s Barnett Plantation on Royal Island (The Bahamas) and more. The team is also considering the possibility of collaborating on a documentary about the historic site. The archeological dig is set to take place fall 2018. Pearce Development is a commercial real estate developer, based in the Lowcountry. The company develops and owns commercial properties throughout the southeast. Hotel Eliza is the firm’s first hotel project and honoring The Pinckney Mansion site and its significance to the history of Charleston remains a commitment.